Stray Promo On Now ! 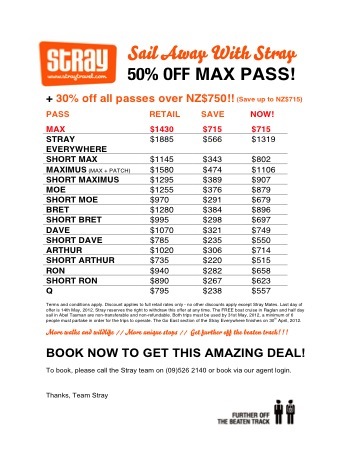 Our partner Stray launched a new promo with awesome discounts on all the passes, going from 30 to 50%. So if you book the Max pass before the 14th of may, the price will not be 1430NZ$ but 715$ on which we add a special INTERNeX discount of 5% making it at 679NZ$ ! So don’t hesitate to talk to us to book your trip, you can contact us by mail at pr@internexnewzealand.com or even come visit us at the office. This entry was posted in INTERNeX, Travel and tagged abel tasman, boat, cruise, discount, fun, INTERNeX, new zealand, promo, raglan, sail, stray, travel, trip on April 5, 2012 by ixrobin.